Hello and welcome to another sketch from the Atlantic Hearts Sketch Challenge. Today's sketch said it was perfect for a thank you card, of which I need quite a few. I'm behind in sending out cards to family and friends who helped me through my recent surgery. And, it was perfect for the color challenge over at the Color Throwdown Challenge. 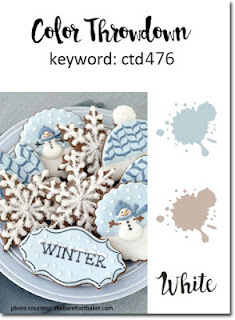 To follow the colors of the challenge, I used Crumb Cake (Stampin' Up! 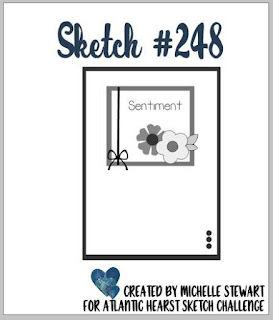 ), Soft Sky (Stampin' Up!) and Sugar Cube (Taylored Expressions) cardstock. It's a Crumb Cake base with a layer of Sugar Cube and I followed through with it for the squares cut from the Stitched Shapes Framelits Dies (Stampin' Up!) The flowers and the little sprig, were cut out of Crumb Cake and Soft Sky cardstock using the Bloomers 4 Dies (Taylored Expressions) and the Flower Box Sprigs & Flowers Dies (Taylored Expressions). The sentiment is a stamp I received from Taylored Expressions as a thank you when I placed an order. It was the perfect size for the area available to stamp. And, for the finishing touches, I added some Soft Sky Twine and blue sequins. I'm very pleased with the way the sketch and the colors all came together to make such a clean and simple thank you card. For all the challenge details and to share your project, visit the Atlantic Hearts Sketch Challenge by clicking the image below. We'd love to have you join us. Great job on the sketch and I love the soft colors and layering and stitching of your panels...beautiful. Thanks, Sue! It was a fun one to work with. I’m in the same boat - owe out so very many cards and desperately trying to catch up before I have to head off again for a period of time. Ha - does anybody make a stamp set that says BELATED and then a whole bunch of add ons like birthday, thanks, get well, congratulations etc. LOLLLL! Beautiful hues to your card - such a gentle thanks which I’m sure will bring warmth to the person on the receiving end. Hoping you have a stellar inspired creative week and get many of your owed out cards made.